French horde Aosoth, with members known from e.g. Antaeus and Temple Of Baal, return with their fourth full length, again via Agonia Records (the reviews on the former full length albums Ashes Of Angels and III are still available within Concreteweb’s Archive Section; see the update on April 13th 2010 and May 7th 2011 respectively). The stuff lasts for forty six minutes, even though the album consists of seven titles only (two tracks last for three minutes only; the rest varies in between seven and fourteen minutes). As from the very first moments of the opening title track I am really surprised by the approach. 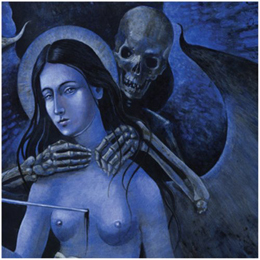 Aosoth are not an infantile project, but this time the expression of grimness is obviously, and gloriously, present. The production is more offensive, oppressive and suffocative than ever before (slightly Funeral-Post-Black-wise abyssal) and this trend goes for the whole album. It’s like the legions of the One with the Scythe are about to orchestrate the listeners’ funeral march. Not only the sound is of satisfying greatness; the compositions (song writing + performance) are too. About the performance I can be short: knowing Aosoth consists of very experienced members, one cannot doubt about their skills and craftsmanship. But when it comes to the structures of the songs, there is a fabulous evolution going on as well. At the one hand the album is cohesive and can be considered a coherent musical experience that does not bore nor confuse; at the other, IV: An Arrow In Heart ‘holds a bigger spiritual value’ (quote stolen from the biography). It means: more variation (in -tempo and intensity), an obscurity rather haunting than aggressive, and much more own-faced self-identity than before. Even though I am a fan of this band since the very beginning, I think each release was just a little better than the former one(s), and with this fourth album I cannot but agree with myself: the constantly imminent positive evolution did not stop here! IV: An Arrow In Heart is sublime!